A comprehensive Step by step tutorial of the brand new Angular 5 implementation with Ionic 3 to create Mobile App. We show you how to access RESTful API or Web Service in this Ionic 3 and Angular 5 mobile app tutorial. After Angular 5 announce yesterday, we have to do a little experiment to implement Angular 5 with Ionic 3 Mobile App development. There are a lot of Angular 5 improvements that make Angular 5 app faster, smaller and simpler. What we build is same as previous Ionic 3 and Angular 4 Mobile App Example but using new features of Angular 5. After installing Node.js and `npm` command works on the terminal (Linux/Mac) or Node Command Line (Windows), open the terminal or Node command line. 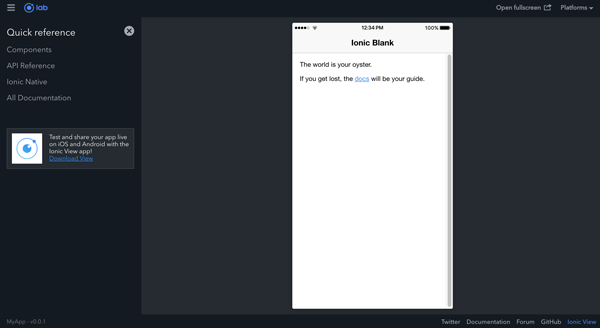 Update Ionic to the latest version using this command. As usual, we always start the tutorial from scratch. On the terminal go to Ionic 3 projects folder then type this command to create a new Ionic 3 app. Then go to the newly created Ionic app folder. Always make sure every new Ionic update working properly by run the new created Ionic 3 app first. It will automatically open the default browser and default Ionic 3 page. Open the newly Ionic 3 app folder in your favorite IDE or text editor then open the `package.json` file to see default dependencies that generated by Ionic 3. As you see in previous steps that generated Ionic 3 app using Angular 4.4.4. Now, it’s time to upgrade the Angular 4 version to the latest Angular 5. Type this command to upgrade it at once after stopping running Ionic 3 app. Now, the dependencies change as below. To make sure the upgrade process successful, run again Ionic 3 app. You should see the previous Ionic 3 default page after the default browser opened. To access or consume RESTful Web Service, we create Ionic 3 service to hold the related functions. Here we will implement the new Angular 5.0.0 HttpClient than bundle with Angular Common library. Type this command for creating Ionic 3 - Angular 5 service or provider, but first, close the running app by press `ctrl+c` key. That command generates provider or service file with the default imports like this. Replace all imports with the Angular 5 `HttpClient` and new `rxjs` feature. Also, replace 'Http' injection in the constructor. Declare URL string variable below class name. We will use free RESTful web service for getting countries. Now, create this function below the constructor. Don't forget to register `HttpClientModule` in `app.module.ts`. Open and edit `src/app/app.module.ts` then add this import. Then add `HttpClientModule` to `@NgModule` imports. 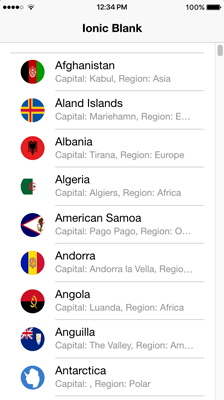 Now, it's a time to display country list on the Home page. First, we have to modify "src/pages/home/home.ts" replace all codes with this. Next, open and edit "src/pages/home/home.html" then replace all tags inside `<ionic-content>` tag with this. To test in the browser, run again this command. You will see Ionic 3 and Angular 4 app on the browser show country list. To test on Android or iOS device, first, update Cordova to the latest version. Now, remove the default generated platform. To run on the Android. To run on the iOS device. That it's, you can find the full explanation about new Angular 5 on this official Angular blog. If you need the working example, you can find the full source code on our GitHub.